American drivers are more willing to embrace self-driving vehicles, according to a new study from AAA. The annual survey reveals that 63 percent of U.S. drivers report feeling afraid to ride in a fully self-driving vehicle, a significant decrease from 78 percent in early 2017. Millennial and male drivers are the most trusting of autonomous technologies, with only half reporting they would be afraid to ride in a self-driving car. Conversely, the concept of sharing the road with a fully self-driving vehicle is still something that drivers are leery of. 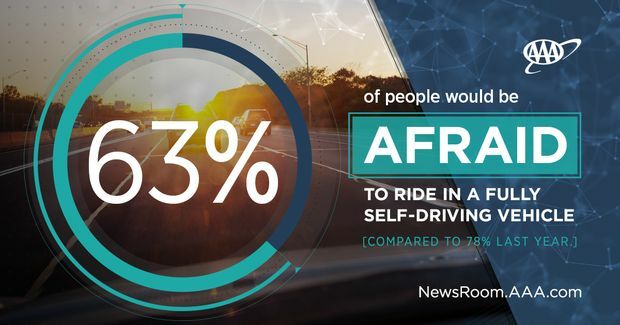 In AAA’s survey, only 13 percent of U.S. drivers report that they would feel safer sharing the road with a self-driving vehicle while nearly half (46 percent) would actually feel less safe. Others say they are indifferent (37 percent) or unsure (4 percent). “This confidence could explain some of the hesitation among Americans to give up control to a self-driving vehicle,” explained Podguski. To help educate consumers on the effectiveness of emerging vehicle technologies, AAA is committed to the ongoing, unbiased testing of automated vehicle technologies. Previous testing of automatic emergency braking, adaptive cruise control, self-parking technology and lane keeping systems has shown both great promise and great variation. Future AAA testing will look at how well systems work together to achieve higher levels of automation. Moreover, to ensure that American drivers continue to be informed, prepared and comfortable with this shift in mobility, AAA urges automakers to prioritize consumer education.